If Apple's iPad mini was equipped with a retina display, we wouldn't hesitate deeming it the best iPad ever. The iPad mini is an exceptionally constructed tablet with excellent battery life and an unsurpassed app ecosystem that the competition simply can't match. However, it's expensive and the lower resolution screen can't display the same crisp text that we've come to expect from Apple's retina displays. "Every inch an iPad". That's Apple's marketing punchline for its smallest, lightest and newest iPad, the iPad mini. Claiming to offer all the features of the traditional, larger iPad, the iPad mini packs a 7.9in display into a superbly crafted body. The mini's exceptional iOS app catalogue, outstanding build quality and super light weight are only let down by an expensive price tag and a screen that can't match Apple's stellar retina displays. If the iPad mini was a boxer, it would undoubtedly be the featherweight champion of the world. To put it simply, you'll be astounded at how light the iPad mini feels when you pick it up for the first time. At 308g, (Wi-Fi only model) it feels much lighter than you expect it to for a product of this size. Putting it into perspective with the competition, the iPad mini has a larger screen than Google's Nexus 7 and is constructed from aluminium rather than plastic, yet it weighs 32g less. Apple products are well known for this sort of engineering, but it's no less impressive when you pick one up for the first time. The iPad mini really feels like a premium device and the build quality is exceptional. The bevelled, laser cut edges, the smooth, rounded corners and the well positioned volume buttons are just some of the touches you'll immediately notice. Although you pay for this meticulous attention to detail, it certainly doesn't go unnoticed. There's no other small tablet on the market that comes close to this kind of excellent craftsmanship. 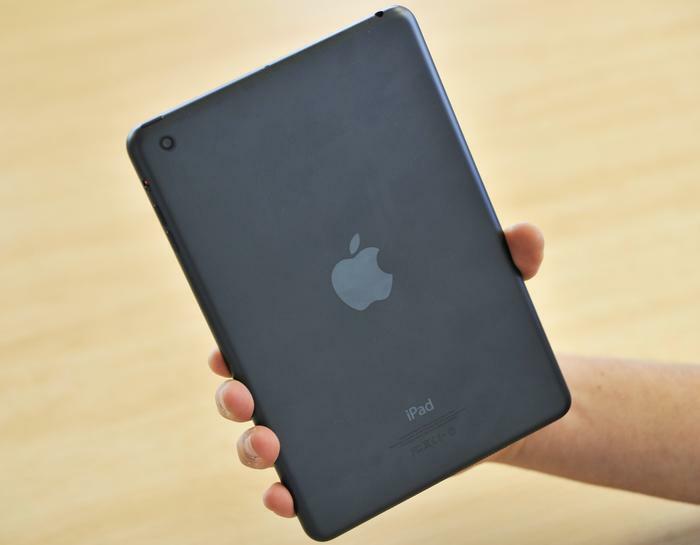 The iPad mini's design borrows much from the iPhone 5. It has a similar brushed aluminum back (without the panels of glass on the top and the bottom) and comes in the same "black & slate" and "white & silver" colour options. The polished, chamfered edges are also similar though these edges are slightly thicker on the iPad mini. Separated volume up and down buttons are located on the left side, just below a mute switch. 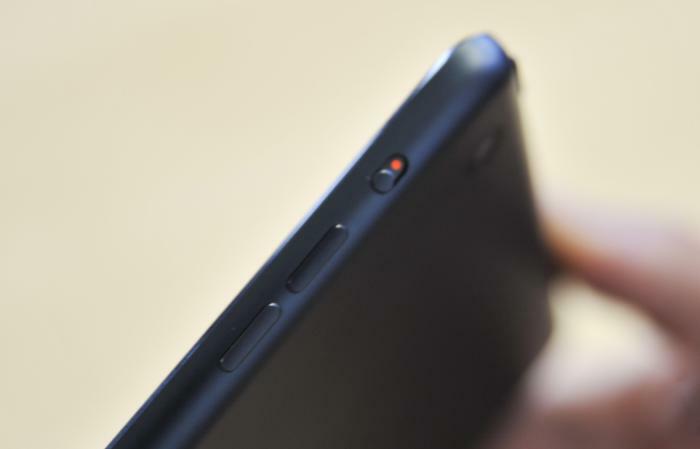 A well positioned power button is on the top of the iPad mini, as is the standard 3.5mm headphone jack. At the bottom, Apple's new Lightning connector is flanked by dual-speaker grills. These pump out reasonable sound for a tablet but you'll still want a pair of quality headphones for any serious listening. At 308g, the iPad mini feels much lighter than you expect it to for a product of this size. Apple's advertising constantly shows the iPad mini being held with a single, outstretched hand. However, users with smaller hands may struggle to replicate this grip as the mini is a little wide. Despite its impressive construction, we also found the iPad mini's smooth back surface hard to grip. Flipping over Apple's Smart Cover with its felt-like surface helped in this regard, but we found the Nexus 7 easier to grip thanks to its faux leather-style finish on the back. One nifty feature is the fact you can rest the edge of your palm or your thumb on the left or right side of the screen without activating it. In our testing, the iPad mini intelligently recognised when we were simply resting on the display most of the time. It's a very useful feature when you're holding the iPad mini single-handedly and using the other hand to touch the display. We found the iPad mini's smooth back surface hard to grip at times. 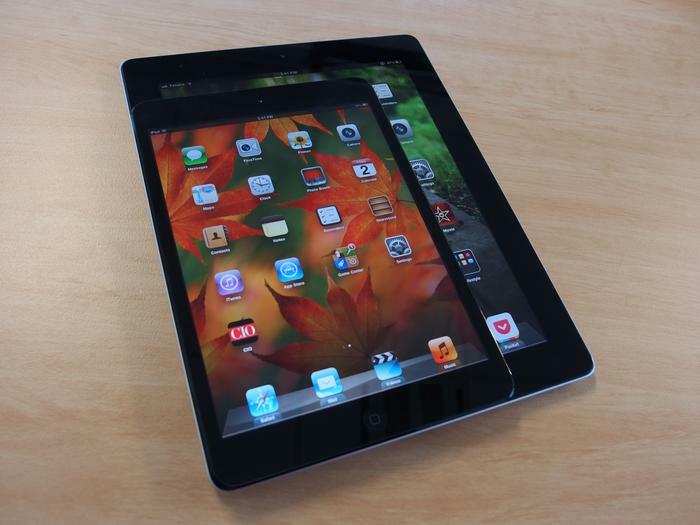 The iPad mini has a 7.9in IPS display with a resolution of 1024x768, the same as the iPad 2. Apple says it kept the display at this resolution so the wealth of third party apps in the App Store wouldn't need to be down-scaled or altered to work on the iPad mini. While that is certainly a valid argument, there's no getting around the fact that the iPad mini's lower resolution display is noticeable. There's no getting around the fact that the iPad mini's lower resolution display is noticeable. If you regularly use the 3rd Generation iPad or the new 4th generation iPad, or any other Apple product with a retina screen, the drop in resolution is immediately apparent. The iPad mini's screen is certainly not a bad display by any stretch of the imagination, it's just nowhere near as good as screens with higher resolutions. This is especially evident in any app that displays lots of text, like Web browsing through Safari, reading books through iBooks and accessing your emails. In these apps, pixels on text that isn't zoomed are very noticeable and the experience is a rather grainy. The iPad mini's screen is certainly not bad, it's just nowhere near as good as displays with higher resolutions. Thankfully, the lower resolution isn't that noticeable when you're doing other tasks, like playing games or watching videos. Colours are bright and vibrant, viewing angles are impressive and the iPad mini is capable of displaying deep blacks. Like the full-sized iPad, the iPad mini's screen is very reflective, which often makes it difficult to see in direct sunlight. Using the iPad mini is largely positive for two main reasons. Firstly, the experience is virtually identical to the larger iPad, only smaller. The screen has shrunk but the device's capabilities haven't, so the iPad mini will run every single third-party app available in the App Store. With over 275,000 apps made specifically for iPad devices, the iPad mini immediately leaves the competition for dead when it comes to apps. The screen has shrunk but the iPad mini's capabilities haven't. The experience is virtually identical to the full sized model. 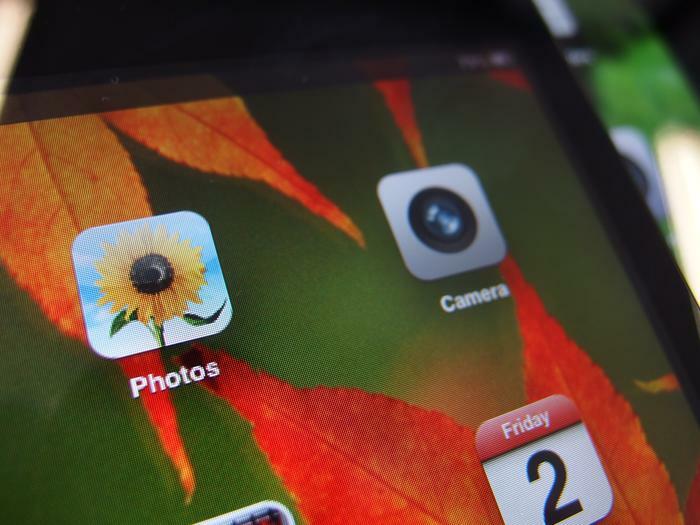 The iPad mini immediately leaves the competition for dead when it comes to apps. It's not the number of apps that's relevant here but the quality of them and the fact that they've been specifically designed for a tablet. Whether it's content aggregation apps like the Flipboard and Pocket, high quality games like Real Racing 2 HD, Modern Combat 3 and Sky Gamblers: Air Supremacy, entertainment apps like Spotify, Showyou and Foxtel Go, or social media apps like the excellent Tweetbot, the iPad mini has a huge advantage over competing small tablets thanks to the well populated, quality App Store. Secondly, the performance of the iPad mini is relatively snappy and responsive. While its older components — an A5 processor and only 512MB of RAM — can't match the internals of the new 4th Generation iPad, they don't affect the iPad mini's general performance. The mini isn't as snappy as its bigger brother when it comes to opening apps, takes a little longer to load graphically intense games, and is a little slower to populate app lists in the App Store, but everyday tasks aren't really affected. The iPad mini's screen orientation still rotates faster than any Android tablet we've tested (including the Nexus 7) and there's no evident lag or delay when swiping through your apps on the home screen. The user experience remains as smooth as any other iOS device. The iPad mini has a huge advantage over competing small tablets thanks to the well populated, quality App Store. With that being said, there are some elements of the iPad mini's user interface that could use some tweaking. In some apps, the smaller screen size means that some navigational elements are a little small. In the Flipboard app, for example, tapping the arrow in the top left corner in an article view can be cumbersome. We also found the address search bar and other elements in Safari to be a little small, while the on-screen keyboard in portrait mode could use a slight size boost. None of these issues are deal breakers, but they definitely take some time to get used to. The iPad mini comes with two cameras. There's a 5-megapixel camera on the rear that's similar to the one used on the fourth generation iPad. It features a backside-illuminated sensor and doubles as a full HD 1080p video recorder. We've never understood the merit of using a tablet to take photos or record video, but the iPad mini's smaller size makes this less of an issue. The quality of still images is not as good as the impressive iPhone 5 and we struggled with motion blur when recording video, so you'll need to keep as still as possible. A photo we captured with the iPad mini's rear camera (click to enlarge). Perhaps more impressive is the front-facing 1.2-megapixel camera, which provides clear Facetime calls. It also works well when used with apps like Skype and Tango which utilise the front camera for video calls. There's no way around it, the iPad mini is pretty expensive. 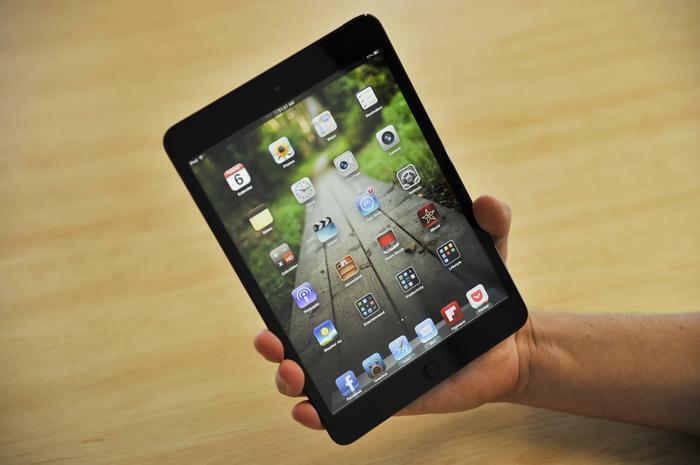 Apple claims the iPad mini is good enough for 10 hours of Web browsing over Wi-Fi or 10 hours of video playback. In our testing we found these claims pretty close to the mark and generally experienced over nine hours of battery life. Even with heavy use consisting of Web browsing, video watching, music listening, the odd game and constant email, the iPad mini easily pushed through a day and a half of use. Although you pay for Apple's meticulous attention to detail, it certainly doesn't go unnoticed on the iPad mini. The iPad mini is also 4G compatible in Australia, if you opt for the Wi-Fi + 4G model. 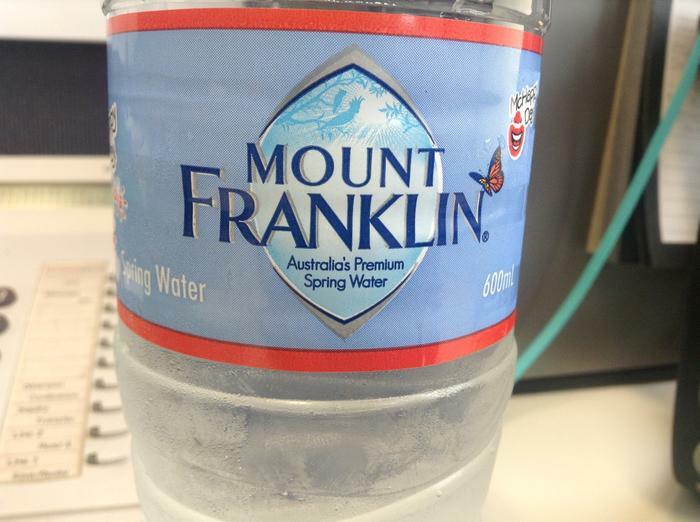 It works with the 1800MHz LTE networks currently operated by Telstra and Optus. We weren't able to test the feature as we were supplied with a Wi-Fi only iPad mini to review, but the faster 4G data speeds in Australia will benefit anyone who regularly travels with their iPad mini. All that's left is the price. There's no way around it, the iPad mini is pretty expensive. Apple will argue that it is not a seven inch tablet and therefore not competing with devices like the Nexus 7. While that might be true, the fact remains that the Nexus 7 represents excellent value for money and is certainly comparable, even if it does have a smaller screen. The iPad mini next to a full-sized iPad. At $369 for the entry level 16GB Wi-Fi only model, the iPad mini is $120 more than Google's 16GB Nexus 7. If you can live with the lower resolution display, the upside of that extra initial outlay is a fantastic ecosystem that no other tablet manufacturer can match. And that's really where the iPad mini truly shines.